Interests:Badges, Buttons, Medals, Photos, etc. pertaining to the uniformed forces of Bermuda, as well as, Imperial Forces with connections to Bermuda. Greetings from Oz (Kansas). 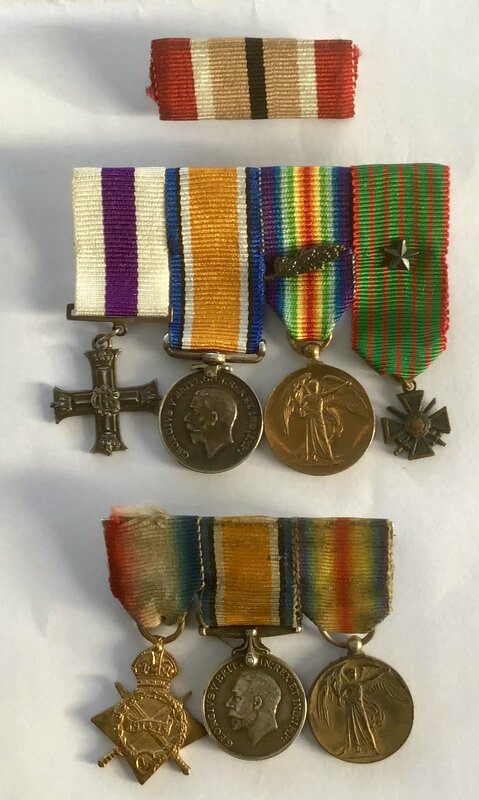 I have the opportunity to purchase a nice Great War Group of Four, photos follow. The Military Cross is unnamed, the CdeG is dated 1914 - 1916. My efforts to find him in the LG have been fruitless Any help providing the LG number and other background will be greatly appreciated. Edit to add: The M.C. action was near Ransart on 16/17 December 1917. Presumably 16/17 Dec 1916 rather than 1917, given that the Gazette entry was in Feb 1917! It looks at some point in time he changed his surname to become hyphenated, by introducing the name 'Fell'. I think that Ron has to be correct, and that the MC Register is annotated incorrectly. The other men on the same page of the register (p49/162 of this free download) are annotated with November/December 1916 dates. The Battalion war diary (Ancestry.co.uk link/National Archives link) notes that he joined them from England on 10th October 1916. The 21 Infantry Brigade HQ diary contains orders and reports on operations for the raid on the night of 16/17th December 1916, which George seems to have led - Ancestry link. The orders say that the raid was to be made against German trenches at map reference W.18.b.70.80. This link should open up on a map (albeit from June 1916) with square W.18 in the centre, where the transparency slider allows a blended view with the modern landscape. I immediately thought the medals were kosher - especially the scan of the reverse. Coldstreamer is right: a lovely group (to George Noel Fell-Smith)! Thank you all for your informative replies. They are very helpful. The information on Smith convinces me to purchase the group. I do have one more question, can anybody provide an estimated value / price range of the group? Also would like to say I am envious of the wealth of info available to you at the click of a mouse. Wish we had the same capability. It is harder for us to access military records, usually you have to hire a researcher to pull the records. That can be expensive.. I have a group of miniature dress medals that almost match your mans .... except the Croix de Guerre which has a star on its ribbon, not a palm. Have tried to find a recipient of my group but to no avail. Got excited when I saw your group! Perhaps a forum member might shed light on the recipient? Searched the Manchester Regiment honours but no fit here.